At Southern Anchorage Retreat we can be part of your GOW experience. There is the opportunity for hikers to plan a short hike, e.g., walking from the amazing cliff tops of Moonlight Head to the Gables Lookout and Historic Wreck Beach,or for an extended walk experience, chat to us about your likes and thoughts. Or complete the final two days long trek- see below. We can tailor a package to suit, that can accommodate your budget- from our low priced suites to our luxury cottages. Meals and transport are available from Southern Anchorage for our Walkers, at an additional cost. So if you want to experience the Amazing Great Ocean Walk, Southern Anchorage Retreat can cater to your needs and make it a unique and luxurious experience- you'll be Amazed and Invigorated! 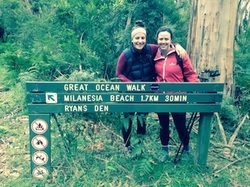 The Great Ocean Walk is an all-season trek that follows the spectacular Great Ocean Road coastline for 104 km from Apollo Bay to the Twelve Apostles. It caters for all hikers and can be easy to challenging depending on your choices. Awesome scenery awaits you as you experience the rugged coastline, deserted beaches, tranquil rainforests and abundant wildlife, such as kangaroos, koalas, echidnas, etc. You may even spy your own personal show orchestrated by passing whales as you look on from cliff tops. We recommend Walk 91 as Victoria's Premier Great Ocean Road walk group, they can organise your trip- right from accommodation, transport and safety equipment. At Southern Anchorage we are right in the middle of the last two or three days of the Great Ocean Walk. On the second last day you start your day from Milanesia beach and wind your way up to the cliff tops of Moonlight Head, along to Gable's Lookout. This is probably the most spectacular day hike for its scenery along the trek and is rated as Hard/Challenging. The final day sees trekkers departing Gable's Lookout, passing historic Wreck Beach and continuing along the cliff tops along to the Twelve Apostles. The scenery is awe inspiring and takes you back to what the Captains of 19th century Sailing Ships experienced as they navigated this rugged and breath taking coast. Click on Link to got to Vic Tourism's GOW site.